Although only two miles apart on the railway, Howth and Sutton stations on the north coast of the Howth peninsula were connected in 1901 by the Hill of Howth Tramway, five and a quarter miles long. The line, built and operated by the Great Northern Railway, reached 365 feet above sea level at the Summit Station, three miles from Sutton. Opened in 1901, this most famous of tramways unfortunately never made a profit and CIE, which took over the GNR in October 1958, closed it down on 31st May 1959. The depot and power station were at Sutton, electricity generation ceasing when an ESB supply was substituted in the early 1930s. 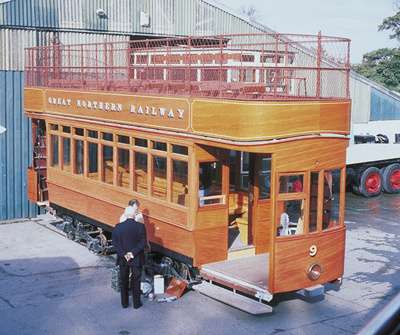 Tom Redmond, the last Howth tram driver, discussing the restoration of No.9 with a museum member in 1992. For its opening, the Hill of Howth Tramway had eight trams, open-top 67-seaters built by Brush of Loughborough. They ran on eight wheels, each of the two Brill 22E bogies having two large and two small wheels, with the motor in each geared directly to the axle with the large wheels. These two driving axles carried about 70% of the total weight, hence the title maximum traction bogies. Traction current at 550 volts dc was drawn from the overhead wires by conventional trolleypoles. In 1902, two further trams, much different from Nos. 1-8, were obtained. Nos. 9 and 10 were 73 seaters built by Milnes, the firm which also supplied Dublin's first electric trams in 1896. There were 41 seats upstairs and of the 32 inside seats, half were back-to-back in a knifeboard arrangement, enabling the passengers to look out more easily. The rest of the downstairs passengers sat on two pairs of facing transverse seats at either end of the cars. Nos. 9 and 10 ran on Peckham maximum traction bogies. The tramway also had a freight and engineering car, No. 11, built in 1903. This was mounted on Brill 22E maximum traction bogies and had a cab at each end, with a wagon body between. No. 11 also had a maintenance tower and at least in its later years was fitted with a telephone which could be connected into the wires along the line. Around 1918, the original crimson lake and ivory livery gave way to varnished grained teak. When the colours changed again around 1930 to blue and cream, Nos. 9 and 10, being used so seldom, remained in teak. Reasons for their lack of use included the awkward seating layout and a tendency to derail because the motors were outside the wheelbase. Furthermore, cross springs were not fitted between the bogies: when these were added in the fifties, their performance improved. By then these two cars were in constant demand and the invariable choice of the many enthusiast groups visiting the line in its twilight years. No. 9 was the last tram to run in public service on the Hill of Howth on 31st May 1959, and thus the last to operate anywhere in Ireland. Following the closure, No. 10 was sent to Britain's National Tramway Museum at Crich in Derbyshire, while No. 2 went to California and No. 4 to Belfast. Due to vandalism and apathy, No. 9 was the only survivor of three cars set aside for inclusion in a future museum here, Nos. 3 and 11 being lost. During years of outdoor storage, vandals, souvenir hunters and the elements reduced No. 9 to a pitiful hulk,. Restoration by Jim Kilroy and his team began in Castleruddery in 1979, and the bodywork was completed fourteen years later in Howth. Innumerable items had to be reproduced, while suitable motors, control gear etc. were obtained from the Amsterdam Tramways and brought to Ireland by the Hardtrot Jones freight company; these will in time enable this historic tram to run again. When the definitive history of restoration in Ireland is written, No. 9 will certainly be a headline for anybody contemplating a similar project.